When I (oops, WE) bought our Dormobile, we had never seen one. I don't think I'd even seen a photo of one. However, when I found out that Mike Smith had one for sale I was curious. I got photos and descriptions of the vehicle and the more I found out, the more I thought it was the cruising vehicle for the Hesses. Sight unseen, we flew to Maine and bought the Dormie. I assume that most folks aren't quite so fool-hardy and would like to have a better idea of what it is they are looking at. First things first. We own a Land Rover Dormobile and almost all the Domobiles I have seen are Land Rover Dormobiles. So the following descriptions are of Land Rover Dormobile features. Other Marques converted into Dormoblies all share fiber glass roofs that pop up from the side but the interior furnishings are often very different and often marque specific. A lot of Dormobiles have become seperated from parts over the years and new owners wishing to restore their Dormobiles need to know what was available and may have come in their Dormobile. In an attempt to help, I have been researching Dormobile interiors and am happy to share what I have learned so far. If you have any additional information or photos, please let me know. Dormobiles were almost always custom built to a customer order specification. What the customer ordered and the number of doors on the Land Rover dictated the final product. This Dormoble was ordered without a pop up top. It received Dormatic seats that folded down into a bed, a Dormobile roof rack and front gerry can mounts. The Martin-Walter ID plate had "special" stamped into it. This vehicle spend most of its years in Africa and now resides in the States. Some Dormobiles, such as this one converted for Babra Toy only received a pop up roof (presumably with the roof cots) and no other interior features. 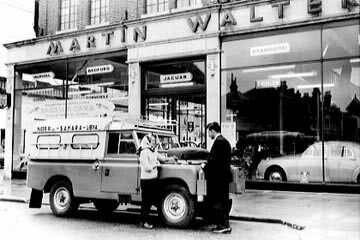 I have the serial number and factory log information to show that this vehicle was a 109 regular that was converted by Martin Walter and loaned by the publicity department of Rover to Barbara Toy. 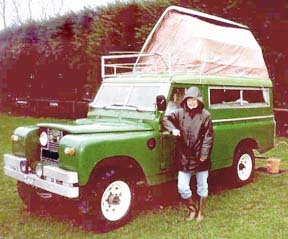 This photo shows the pop up roof, a Martin Walter Dormobile optional rack above a front tropical shield and the optional front gerry can mounts. Note the external ladder mounted horizontal on the rood side. Presumably that was ordered to allow Barbra to access the roof rack. However most Land Rover Dormobiles received a pop up top and a full caravan interior. 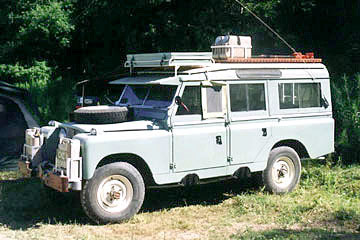 Land Rover Dormobile conversions were made between the late 1950's to around 1974 with the largest grouping evidently built into series IIA 109s. By far and away the majority of Dormobile conversions were built into the 109 5 door stationwagon. While 109 three door Dormobiles were an option, evidently very few were actually built. The LR 625 option would be the necessary configuatrion for a 109 three door Dormobile because the bulkhead behind the row of seats would keep the seats from laying flat. This Martin Walter built Land Rover Dormobile came with a complete custom interior which only includes 2 bunks at the roof level making it a LR625 option. The LR 262 version seems to be their standard version. The side benches in the rear of the 3 door are higher than those of the 5 door. The standard Land Rover Dormobile furniture common to the 5 door versions will not fit into a 3 door. This is why all the Martin Walter factory outfitted 3 door versions I have so far learned about either have no interior furnishings or have Custom Martin Walter made furnishings.